Angela and Jeffrey Carver have a new arrival to announce. Samantha Elizabeth Carver was born on Tuesday Jan. 25th at 5:50 p.m. Samantha was 8 pounds 6 ounces and 19 inches long. Angela and Samantha are both home and doing wonderfully. Kimberly Denise Smith was born on February 5, 2005 at Akron City Hospital. She is the daughter of Kristin Robinson and Joshua Smith of Akron, Ohio. Paternal grandparents are Mark and Robyn Smith and Larry and Kim Blair, all of Akron. Maternal grandparents are Mike and Denise Robinson of Akron. Kenneth and Sharon Lindley of Minonk are maternal great-grandparents. Click here for photo. Anthony and Brandi Hofmann of Minonk announce the birth of their second son, Christian Patrick Hofmann. 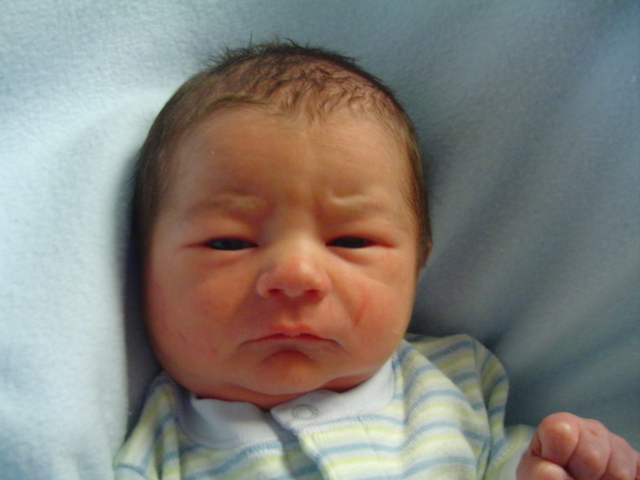 Christian was born at Illinois Valley Community Hospital arriving at 8:11 AM on Thursday, March 10, 2005 weighing 8lbs. 13 oz. and was 20 inches long. Christian is welcomed home by his brother Harrison. Maternal grandparents are Ronnie and Denise Kline of Minonk. Maternal great-grandparents are Linda (Seifert) Zulz and the late Bill Zulz of Wenona, and Dannie Kline of Lomax. Paternal grandparents are Jim and Pat Hofmann of Lostant. Paternal great-grandmother is Mildred Philips of New Lenox. 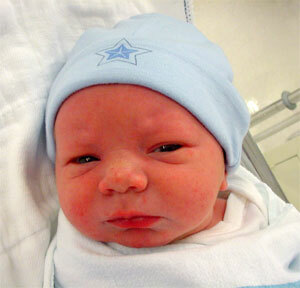 Jeremy Douglas Lane was Born to Bryan and Kelly (Rhodes) Lane on April 18, 2005. Jeremy weighed 7 LBS. 4 Oz. and is 18 Inches long. Paternal Grandparents are Bill and Shirley Lane of Bloomington, IL. Maternal Grandparents are Janice Rhodes, Bloomington and the Late Daniel Rhodes. Jeremy has 5 older sisters, Chelsea, Danielle, Jordan, Kayla, and Bryanna. Click here for photo. Kaleb Alexander Embery was born to Nicole Howell and Steven Embery on May 19, 2005 at 1:00 P.M. Kaleb came into the world at 8 lbs. 13 oz. and 20.25 inches long. His grandparents are David and Tina Howell of Minonk and George and Lisa Embery of Bloomington. He has a 2 year old brother named Kourtland. Carolyn Rose Megow was born Aug. 19, 2005 at 8:28 AM, 7lbs. 9oz. 19 1/4 inches. Happy Brother John (4) and Parents are Mike and Janis Megow. Grandparents are Melvin and Phyllis Matter, Minonk. Roberta Megow, Suring, WI. Noah Joshua Marsack was born at Bromenn Hospital September 6th at 5:17 pm weighing 8 lbs 6 ozs and 21.50 inches tall. Parents are Cassie and Joshua Marsack of Pontiac. Grandparents are Linda and Bob Mouser of Minonk. Great grandparent is Nora McGuire of Minonk. He is welcomed by his two brothers Austin 7 and Gavyn 4. Russell and Lanna Ruestman of Minonk are proud to announce the birth of their second son, Brady Lee Ruestman. Brady was born October 13, 2005 at St. Joseph Medical Center in Bloomington, Illinois weighing 8lbs 10oz and 22 inches long. Maternal Grandparents are Homer "Butch" and Donna Hixson of Gibson City. Paternal Grandparents are Rodney and JoAnn Ruestman of Minonk. Brady was greated at home by his four-year-old brother, Parker. Brady shares his name with his cousin, Jordan Lee Ruestman. Click here for photo.